It’s that time of year again where fruit is in season, and a few weeks ago, cherries were on sale at my local market. I’ll be honest and tell you that as I do like cherries, they are not my favorite fruit. I know those folks like my father-in-law who will show up to a picnic with a bag of them and chomp away at them, and I recall my dad sitting around on a couch nibbling on them for some time as well, but me? Well, not so much. I did buy them with the idea that my kids would make an attempt, or better yet, my wife make an attempt at eating them, but a few days later, I still saw the lonely bag of cherries. I ultimately knew that if I was not going to take matters into my hands and do something about the cherries that they would most likely go to waste. That’s when I remember seeing a show about removing the seeds from the cherries by using a straw. Yes, a straw. I figured what a better way to see if the straw technique actually worked, rather than buy some pitter gadget. The straws worked. That’s when I thought of macerating cherries for the upcoming cocktail season. I’ve made macerated cherries in brandy some time ago, and they were awesome, so why not soak them in vodka, right? How can it get any easier than that right? Using a straw (I use a metal straw), insert into the center of the cherry, at the stem side, and push the pit through the cherry. Repeat. You can also wear gloves while doing this as the cherry juice stained my hands for a few days. No lie. 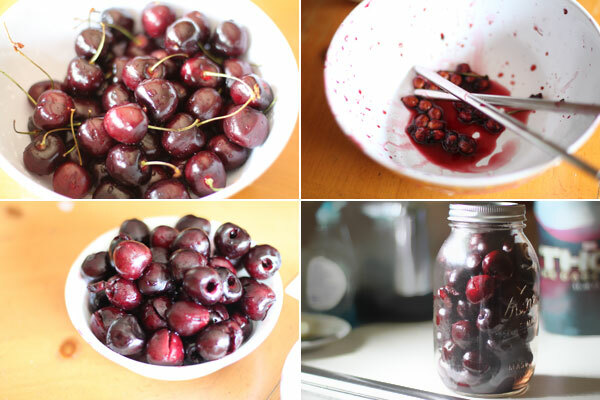 Once the cherries have been pitted, fill them to the top of a mason jar. I used a large mason jar, just because I wanted more cherries. Once filled, pour in your favorite vodka all the way to the top. Seal with the lid, and cover tightly. Place in the refrigerator for a couple of weeks. When you are ready, for some out and enjoy, otherwise serve them in some sparkling water, white soda, or place a couple on a skewer in a great summer time cocktail. Enjoy! This recipe reminded me of an old Russian peasant recipe for cherry liqueur, where you don’t care what happens to the cherries. Leave the stems on and the pits in the cherries. Layer them with sugar in a jar, about 1:3 ratio, sugar to cherries by volume. 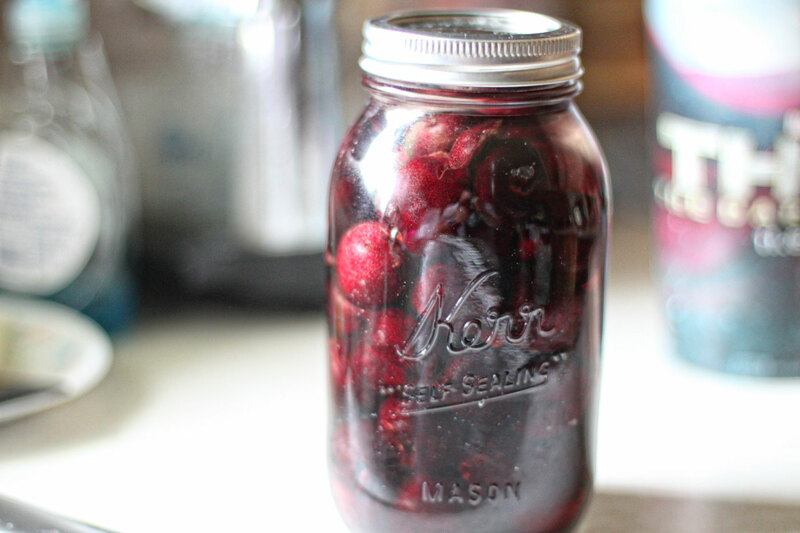 Pour vodka over cherries to cover, cap the jar and place it on a sunny window sill. Turn the jar every day or every time you think of it. Eventually, the cherries turn ugly, because all their wonderful color and flavor go into the vodka.